Visually fresh yet familiar, this ornate bookmark combines old-school nostalgia with the life-changing words of Scripture. A Bethany Berndt-Shackleford design. Made of thin pliable PVC with rounded corners and silk floss tassel. Waterproof matte finish resists smudges and improves durability. Blank white backside has writing area for To/From info and a personal message. Readers will be inspired and fortified by this marker's intricate design and uplifting verse! Coordinates with all items in the Joy Range of the Retro Blessings Collection--a charming accessory to enhance reading pleasure! 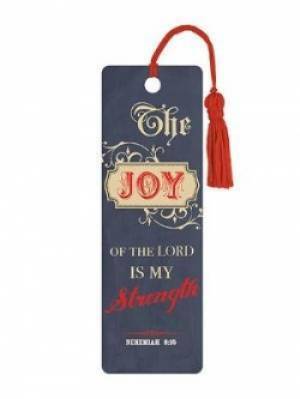 "Joy" (Blue) PVC Bookmark was published by Christian Art Gifts in January 2008 and is our 5505th best seller. The ISBN for "Joy" (Blue) PVC Bookmark is 6006937116160. Be the first to review "Joy" (Blue) PVC Bookmark! Got a question? No problem! Just click here to ask us about "Joy" (Blue) PVC Bookmark.